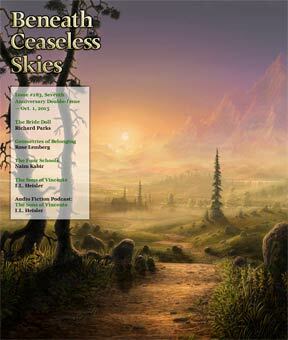 Beneath Ceaseless Skies (ISSN 1946-1046) is a SFWA-qualifying, pro-rate online magazine dedicated to publishing literary adventure fantasy: fantasy set in secondary-world or historical settings, written with a literary focus on the characters. In ten years, BCS has published over 550 stories and 225 audio fiction podcasts. The magazine or its stories have been finalists for seven Hugo Awards, three Nebula Awards, one British Science Fiction Association Award, three Parsec podasting awards, three Aurealis Awards, and nine World Fantasy Awards, and stories from BCS have won the Aurealis Award and the World Fantasy Award. We love traditional adventure fantasy, including classics from the pulp era and the new wave of post-Tolkien fantasy. But we also love how the recent influence of Realist literary writing on fantasy short fiction has expanded the genre, allowing writers the freedom to use literary devices such as tight points-of-view, round characters, unreliable narrators, discontinuous narratives, and others. This sophisticated level of craft has made fantasy short fiction more powerful than ever before. We want stories that combine the best of both these styles—adventure fantasy plots in vivid secondary worlds, but written with a literary flair. Beneath Ceaseless Skies features exciting stories set in awe-inspiring places that are told with all the skill and impact of modern literary-influenced fantasy. Beneath Ceaseless Skies publishes two stories per issue, with a new issue every two weeks. Readers can subscribe by email notification or by RSS feed, or for automatic delivery to Kindle. We release all issues as ebooks and selected stories as Audio Fiction podcasts. We publish annual Best-of ebook anthologies and occasional theme anthologies of stories from the magazine. We maintain a News page, a Facebook page, and a Twitter feed @BCSmagazine to update submitting writers and to encourage reader discussion of our authors, artwork, and stories. We are a 501(c)3 non-profit organization supported by reader donations (which are tax deductible), including via the BCS Patreon page.